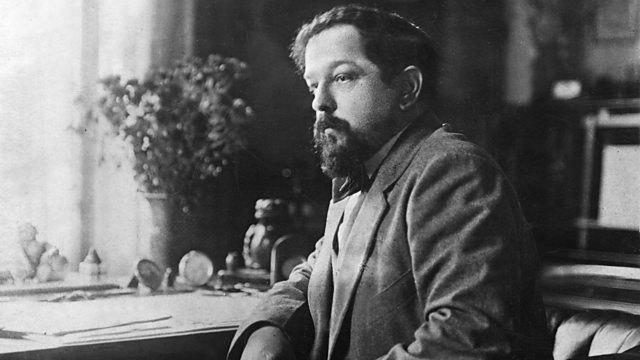 Donald Macleod examines Debussy's friendship with writer and poet Pierre Louys, with whom he worked on several projects including Chansons de Bilitis. Debussy's association with the writer and poet, Pierre Louÿs, the friend he said he loved the most. Over the course of the week Donald Macleod explores the musical fruits of Debussy's relationships with the society hostess Madame Vasnier, writer Pierre Louÿs, poets Stéphane Mallarmé and Maurice Maeterlinck and the ballet impresario Sergei Diaghilev. Born in 1862, Debussy's childhood was overshadowed by periods of uncertainty and poverty. His father Manuel was in and out of employment and his mother was obliged to work as a seamstress to make ends meet. During the Commune, Debussy's father enlisted in the National Guard but family life hit a further stumbling block after the movement was crushed in 1871 as Manuel Debussy was put on trial and imprisoned. On identifying a natural talent and a potential income, young Debussy was steered towards a career as a concert pianist. He began his studies at the Paris Conservatoire at the age of 10, the twelve or so years he spent there being the only formal education he received. By the time he graduated he had made many useful contacts, some of whom we'll encounter across this week, as well as coming to the conclusion that he should focus on composition rather than performance. Continuing this week's exploration of Debussy's relationships, Donald Macleod examines his friendship with the writer and poet Pierre Louÿs, with whom he worked on several projects including Chansons de Bilitis as well as enjoying each other's company socially. Performer: Jean-Pierre Armengaud. Performer: Olivier Chauzu. Performer: Gilbert Kalish. Singer: Dawn Upshaw.